Chris Roberts' Star Citizen game has raised over $8.6 million so far, and fans continue to jump in even though the game is more than a year away. GamesIndustry International sat down with Roberts at GDC for an exclusive interview to find out how the game is progressing, what Roberts has learned so far, and what lies ahead. Several months into the process, the game remains on schedule. "We've got a really good core team together, and we're getting our pipelines up and running," Roberts said. The development plan for the game does not follow the classic structure, where the effort is bent towards creating an alpha with all the parts of the game working after a year or more of development. Instead, the team is working on what Roberts calls "an iterative release plan." "The engine is primed, and in the next couple of months we're going to start sharing more gameplay videos," Roberts said. "The way I'm thinking of doing it is the game's two years out, but we're planning to release parts of the ultimate game early. A good example is in August, for Gamescom and PAX Prime, we're going to release the Hangar module, which essentially is in-engine. 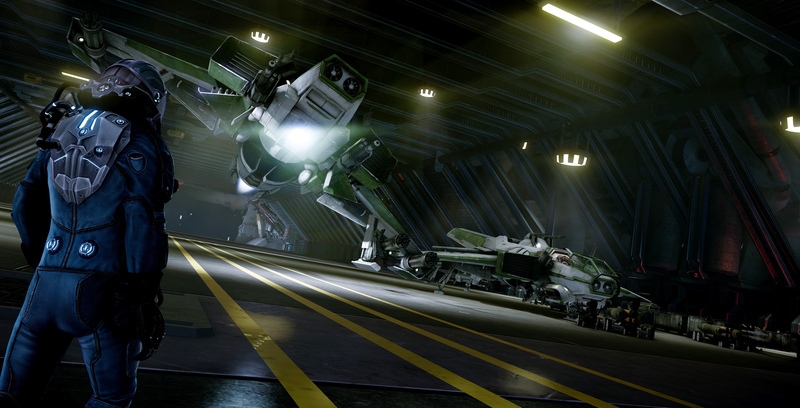 You walk into your hangar and look around the ships you've backed, get into the ship and walk inside it, and you'll even be able to invite some of your friends to your hangar. We'll probably have some of the customization options ready by then, so people can actually see all this stuff they've bought, which would be really cool." The next release scheduled is much more active than the Hangar module. "At the end of December we're going to have the Dogfighting module, which is taking the ship that you've backed into a deathmatch with other players or AI," said Roberts. 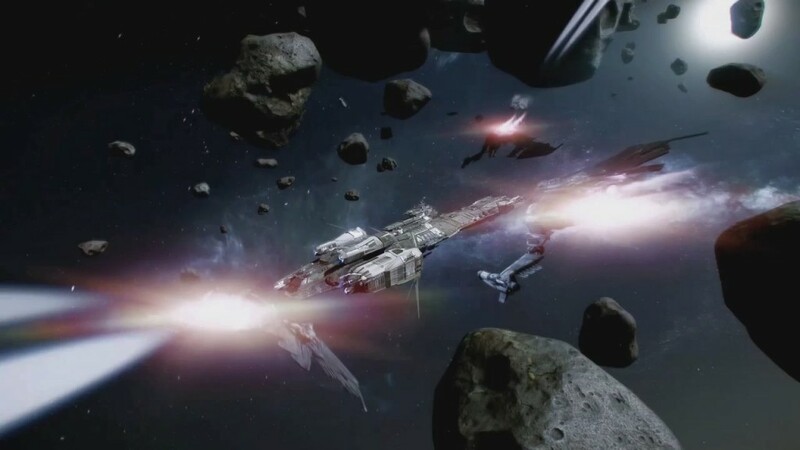 "There won't be any persistent universe, there won't be any single-player story, but it's really for us to balance combat, the weapons, and the ships. We'll test the back-end server infrastructure for how many people we can get in one area, the tolerance on latency and all that stuff. You'll be able to customize your ship, put weapons on it. By that point we've got opportunities to bring new people in, which generates more revenue. Even the current people will probably want to create a ship, create a weapon, and that will generate more revenue." This non-traditional schedule is based on looking at what the players would like to get, and that's something Roberts is passionate about. "The thing I find really fascinating is that my mindset's completely changed," Roberts explained. "I have this community that's been incredible. They've backed me way more than I thought they were going to back me, and we still get new people every month. We generated $800,000 in February alone, which is crazy. We don't even have a campaign going, we're not even selling new ships or anything, and we don't have a game." "We generated $800,000 in February alone, which is crazy. We don't even have a campaign going, we're not even selling new ships or anything, and we don't have a game"
Roberts believes this process will result in a better game on a shorter time frame. "The typical way, even on an MMO, was 'OK, we're going to work on this MMO for four years, now we're going to do a closed beta' and you've got all these systems that come online and all these problems that start to sprout up. It's almost overwhelming," Roberts said. "When you have shorter development times it focuses you. Normally you're not that focused in the beginning until you get to the last year and then you're running around like a madman. Part of the idea is to break down the overall project, and fortunately it has a lot of discrete aspects - dogfighting in space can be fairly discrete - so you break it up and then say we'll release this on this day and the team has to focus on that." The engagement with the community has already improved the game. "We've gotten feedback from our community that's made it a better game, even at this early stage," Roberts noted. "Surveys where you get tens of thousands of people give you a much better idea of what people want. We polled quite a few times what people wanted to be doing, and explorer was the number one choice, which I did not think would be the case. I thought it would be mercenary, or fighting, or trading. What happens with that is we focus more resources on exploration; it's what 60, 70 percent of people want to do. That sort of thing is really useful early in the process; if you make the wrong guess you could waste man-months." This process has another important difference with the classic development process. "Unlike with a publisher, you can't pull the wool over their eyes because it's the real people who are going to be playing it," Roberts noted. "If you're a publisher you can visit me and I can show you the milestone, but you have no idea if behind the scenes I've got it jury-rigged or whatever. Whereas with the real community, there's no way." Roberts is pleased with the impact this process has had on his team. "I've noticed the energy and the motivation on my team, because we're building in a very open format and we're sharing," Roberts said. "They're actually very excited because they feel they've got people every day who are totally into what they're doing and think it's cool. You get up in the morning and know that you're doing something that matters, because I know I can log on and there's hundred thousand people wondering what I'm doing. Everyone at our company has to spend at least an hour a week in the schedule online with the community on forums or chat, because we want them to be talking to the community and find out what they're saying." That's very different from the classic publisher model, which saw virtually no communication with the public. "In the old days you'd work on a game, then put it in a box, then basically throw it over the fence into marketing and sales," Roberts said. "You'd hope to get a good reception. You weren't really connected to the community, and if there were any problems filtered back to you it was only the worst ones. Maybe you would respond to criticisms in the next game, the sequel. I feel like this [crowdfunded approach], where you're directly plugged into the community, is almost like doing it live. You can pivot on feedback very quickly in the same product, without having to wait for the next version." Roberts summarized the advantage of early feedback this way: "In any system you build, knowing earlier is always much better than knowing later." "Unlike with a publisher, you can't pull the wool over their eyes because it's the real people who are going to be playing it"
The open nature of this development process, Roberts feels, can help avoid problems with the fans if there's a software issue. "I think this is EA's problem with Sim City," Roberts said. "They're still trying to deal with stuff like they did in the old days where they could control the message and you can't now. The truth is out, and you're better off coming out with it in the beginning and being really transparent and honest. Generally if you do that everything will be good. That's the way I'm approaching it with everyone who's backed us. At some point, if we slip or do something, we'll say 'OK, here are the reasons why.'" The game has already gathered over 150,000 backers; how high does Roberts think sales will be when there's actually a game available? "I think people this early maybe represent five to ten percent of the total audience," Roberts explained. "Just based on the ratio of the people who liked Wing Commander... the number of backers in Germany is like 14 or 15 thousand. We sold 400,000 units of Wing Commander III in Germany alone, and that's assuming no market expansion from 1994 or 1995. I think there is. If you look at FTL, and FTL is difficult because it's a very small game, it did much more than 10x in the number of actual sales compared to the number of backers they had. They had like 10,000 backers and did two or three hundred thousand in sales." Roberts continued, "My gut sense is that 5 to 10 percent of your audience is going to back you early, and I think that number is variable based on the quality. When you do something really good, it's a lower percentage; if you do something that isn't so good maybe it's 20 percent or 30 percent. I'm assuming if I deliver the game I think I'm going to deliver, if it holds up to the level of Wing Commander or Freelancer or Privateer, I think 10x would be a pretty conservative number. I think that would be right in there with what I did in the '90s. What crowdfunding has proven is that those people are still out there." The success of other games in the market also gives Roberts hope. "World of Tanks is a good example," Roberts said. "I know it's not the hardest-core sim, but I would never have guessed they'd have 45 million people downloading it. In the old days if there was a tank sim it would have sold fifty or sixty thousand units." Wargaming's business model also appeals to Roberts. "In World of Tanks if you put the time in you can buy pretty much everything," Roberts pointed out. "If you want to shortcut, because you don't have 40 hours a week to spend gaming but you've got five or six hours on a weekend, then you can buy some credits with some money. My understanding is they're the highest-monetizing of all the free-to-play games on a per-person basis. I'm hoping that combination of things will work well for us. Probably because that style of game is like Privateer or Freelancer, which inherently is all centered around the economy - buying, selling, trading. It's a very natural game to work with that kind of mechanic." The changing nature of the business brought Roberts to this point. "When I left the industry for a while it was because I was burned out," Roberts explained. "You had to be part of a big mothership, whether it was EA or Microsoft or Sony, to make these games. They controlled the distribution. The days when I was at Origin as a scrappy developer-publisher, misfits trying to make your way in the industry, had gone away. I feel like now the way digital and online is happening that it's open again." "The bigger companies have problems because they can't adjust to the trends quickly enough. EA I feel has done a relatively good job positioning themselves; it's made a lot of investments in online and digital. They treat it with a very top-down method. Edicts will be like 'we now need in-app purchase for everything.' My personal feeling on EA is they'd be far better served by essentially breaking the company up into discrete units that could actually react to their particular market segment without having to pull in line with everyone else. That's what I like about what we're doing." "I think as the industry gets bigger and it diversifies, there's room for many different things"
Roberts doesn't harbor ill feelings towards big companies; it's just not the way he prefers to do business anymore. "I'm still very fond of EA," Roberts said. "I think they're all great people, but the problem is I would always have these arguments with marketing and sales about who the audience is. All that's gone away because I'm plugged right into the audience. There's no interpretation going on. I also don't have to try to fit into bigger corporate strategies that may be good for the whole company but not necessarily good for my part." Roberts gave an example of what he meant. "With Wing Commander there were compromises I made on certain projects because we were part of EA. I wasn't planning on Wing 4, but at the time there was a console transition and Wing 3 was the biggest-selling game they had on their books at the time. They told me, 'We need another one of your games or we're screwed this quarter unless you do it. Can you make the game in seven months?' We didn't quite do it in seven months, we did it in nine, but it's still amazing to me. There were compromises made in the game; I did it because EA was like 'We really need this' and that's what you do when you're part of the company. In this case I feel that I don't have to worry about that; there should not be any compromises made." What's the future of crowdfunding? "I definitely think crowdfunding is going to be part of gaming going forward. I really like what it's doing," said Roberts. "There's this whole idea that one thing is the dominant platform. It used to be console's in, and then console's over and it's Facebook, now Facebook's over and it's mobile, now mobile is passé and it's tablet and free-to-play. I think as the industry gets bigger and it diversifies, there's room for many different things." "You'll still have these big blockbusters, and that's going to be the domain of EA, Activision and Ubisoft," Roberts said. "What I do think what has happened is that the middle ground that used to exist, and the publishers used to fund, like my games or an RTS, would sell a million or two million units. On the Activision and EA scale of things they're not getting out of bed unless they think it's five million units, and they really want ten million or more. They probably lose money selling two million units. Whereas if I sell two million units I'm making a lot of money, for two reasons. I don't have the same overhead and costs, and also I capture a lot more of the dollars. On our stuff right now, we capture 96 percent of the dollars; that goes straight to us." "In the old model as a developer I would have captured 20 cents on the dollar," Roberts said. "Ultimately that means I can make the same game for a fifth of the revenue, a fifth of the sales, and I can be more profitable, and I can exist on lower unit sales. I think that's good for gamers, because crowdfunding and digital distribution are enabling more nichey stuff to be viable. It's also allowing gamers to have their voice heard, and have their influence earlier in the process. You don't really have your input into how Call of Duty's being made." 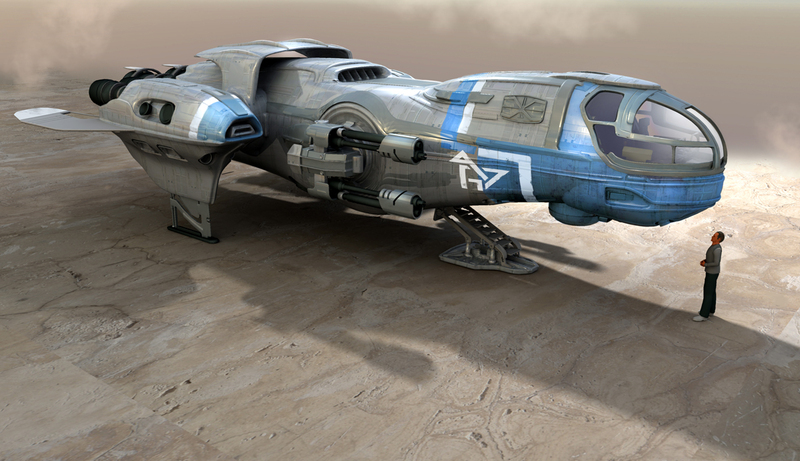 The PC is not the only possible platform for Star Citizen; Roberts' reaction to the PS4 is positive. "It's a nice piece of hardware, but I think it's going to be hard for them to go much less than $400 without taking a massive loss on it," he said. "The good news is that it's essentially a PC, so that means PC owners will get much better ports of console games. I'm not a PC elitist by any means; if I could be on the PS4, and they were open, and I could do the updating and all the sort of stuff we're trying to do on Star Citizen, then I would definitely consider putting it on PS4, because it's essentially a PC with a friendlier operating system." Roberts is optimistic for the game industry as a whole. "I think the console business will be healthy for quite a while, I think the PC business, the tablet business, the mobile business, they'll all be healthy," Roberts said. "I think there's money to be made in all of them. I just like the PC business because there aren't a lot of people competing there." I think the biggest downside to Kickstarter has yet to reveal itself, which is dealing with the fallout when the finished product doesn't meet the backers' expectations. This will happen in two ways - any real project will shed commitments as it gets closer to finaling, leading to the end result being significantly different to what was promised. Second, every backer will have an idea of the game constructed mostly from their own imagination, which will probably be very different to what the devs actually build. Both of these disconnects will be viewed as 'promises being broken', leading to wailing and gnashing of teeth once things are actually released. The traditional model doesn't have this problem because buyers only see the finished product (of course, disconnect between the marketing and reality of the game can still have a similar effect, as recent events have shown). In short, the Kickstarter projects that have succeeded have done so partially due to hivemind behaviour on Reddit and elsewhere, and the same hivemind that gets your game funded can be incredibly vengeful and single-minded in their devotion to your downfall (I think they call this 'circlejerking'). This will happen in two ways - any real project will shed commitments as it gets closer to finaling, leading to the end result being significantly different to what was promised. Not to disagree entirely with your post, but I think what is described above won't happen until a very immature developer creates something that's Kickstarter backed. The only reason I say this is because the devs who have so far used it are very aware of the commitments they've given, and are very aware of the fanbase that's providing the funding. A good example of this is Shadowrun Returns, which has had its release date put back by a few months, in order to put everything that was promised into the game. That and there seems to be ONE great thing about the "hivemind" mentality (well, THIS type of mentality) - donators ASK for and usually GET what they want to see as opposed to a developer taking money and doing what they want with it just to release a half-assed product to the masses that paid for it. I think the biggest downside to Kickstarter has yet to reveal itself, which is dealing with the fallout when the finished product doesn't meet the backers' expectations. Its quite simple actually. They will have problems raising money for the next project. hat and there seems to be ONE great thing about the "hivemind" mentality (well, THIS type of mentality) - donators ASK for and usually GET what they want to see as opposed to a developer taking money and doing what they want with it just to release a half-assed product to the masses that paid for it. That is actually where i see a great potential - to involve the community in the design & creation process. Sure, it wont be perfect (too many cooks), but the devs could get feedback from their focused target market. Most of the veteran developers on Kickstarter have been pretty up front with what they're doing and most of the time the backers are mature enough to have realistic expectations. If you think about it, most games are sold on dreams anyway and people purchase first day having not read any reviews. While some people think there might be a backlash against Kickstarter general if one turns out poorly, I think it's more likely that it will simply work on a dev to dev basis - if people are pleased with what they see from projects from one developer, they'll continue to get more funding and if not, they probably won't. Most of the veteran developers on Kickstarter have been pretty up front with what they're doing and most of the time the backers are mature enough to have realistic expectations. "What I do think what has happened is that the middle ground that used to exist, and the publishers used to fund, like my games or an RTS, would sell a million or two million units. On the Activision and EA scale of things they're not getting out of bed unless they think it's five million units, and they really want ten million or more." And this is what opens the door for disruptive competition, innovation and technology. I like the way he's honest! Hello, i'm producing one of the best games i've possibly ever made! Oh and btw I like money, so if you'd please give it to me! Thanks! I like that! Lots of companies are much more hypocrite on this sensitive subject! Hats down to you Chris!